One of our core focus areas is supporting entrepreneurs and small business development in our community. We provide space and support for several small businesses utilizing our repurposed buildings and shop spaces. We actively support the development of social-ventures that lead to hiring locally, job training, and advance social & environmental community initiatives as partners and collaborators. Furthermore, we are working to implement unique tourism strategies that create opportunities for visiting the Cuyama Valley while appreciating the rural lifestyle our community holds close to their hearts. With over thirteen million people living within a three-hour driving radius, the Cuyama Valley is an ideal spot to explore the beautiful high desert of California. Using creative community engagement as one of our key strategies, we’re working to create a space that welcomes locals and visitors alike, while supporting a diverse range of projects and events. 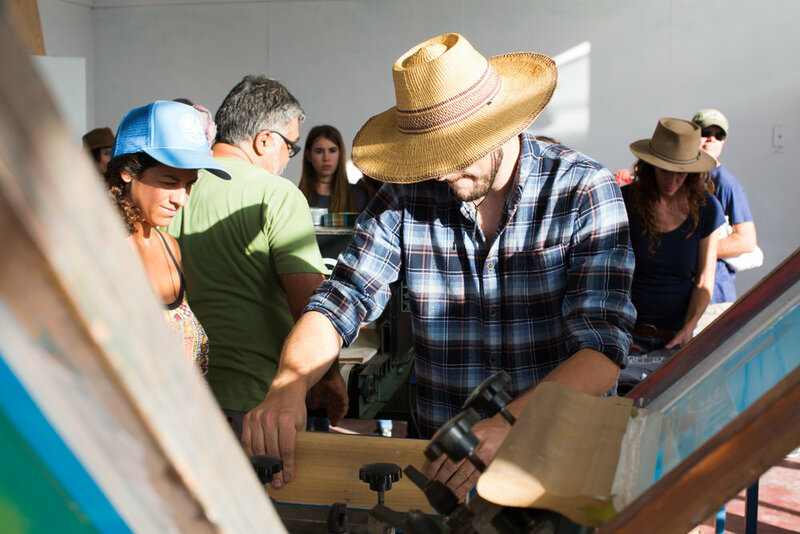 We are seeking partnerships with academic institutions to create place-based educational opportunities, while also developing space and tools for professional artists and designers to create work in and with New Cuyama and the Cuyama Valley. By fostering creative people and projects here in the valley, we are growing a diverse community of stakeholders that each contribute meaningfully to the unique identity of our place. The Cuyama Valley is a highly productive agricultural region located in Santa Barbara County's northeast corner. As a valuable agricultural resource in the region, we believe the Cuyama Valley can greatly contribute to our regional foodshed. We are working to foster strong and equitable partnerships with local community organizations, foundations, business leaders, small and large agricultural producers, and school districts with the ultimate goals of increasing access to healthy, affordable food and growing a resilient local food system. Strategies to achieve these goals include developing programming for youth culinary arts and nutritional education, establishing a community kitchen space for new entrepreneurial food ventures, building a network of local producers, and cultivating our 300+ acres of agricultural land to increase local food production. HAVE YOu HEARD ABOUT THE CUYAMA KITCHEN? The Cuyama Valley is home to the unincorporated townsites of New Cuyama (pop. 517), Cuyama (pop. 57), and Ventucopa (pop. 92). New Cuyama's housing was built in the early 1950s by the Atlantic Richfield Oil Company (ARCO), with 94% of existing homes built before 1953. Despite demand, there has been little to no new housing stock built in the community since then and 23% of homes are in need of major repair. Through housing research, advocacy, and community outreach, our organization is committed to improving access to healthy and affordable housing within the Cuyama Valley. We're committed to research and data collection in order to develop reports, case studies, and a general body of knowledge on our community. Follow the link to review our existing studies and reports. We draw on a wide variety of resources to inform and enrich our work. Click the link to check out our favorites.